Our guest author/artist today is Zara Tuulikki Rooke. She recently shared the experience of shearing her sheep with a note that Spring will bring new lambs. 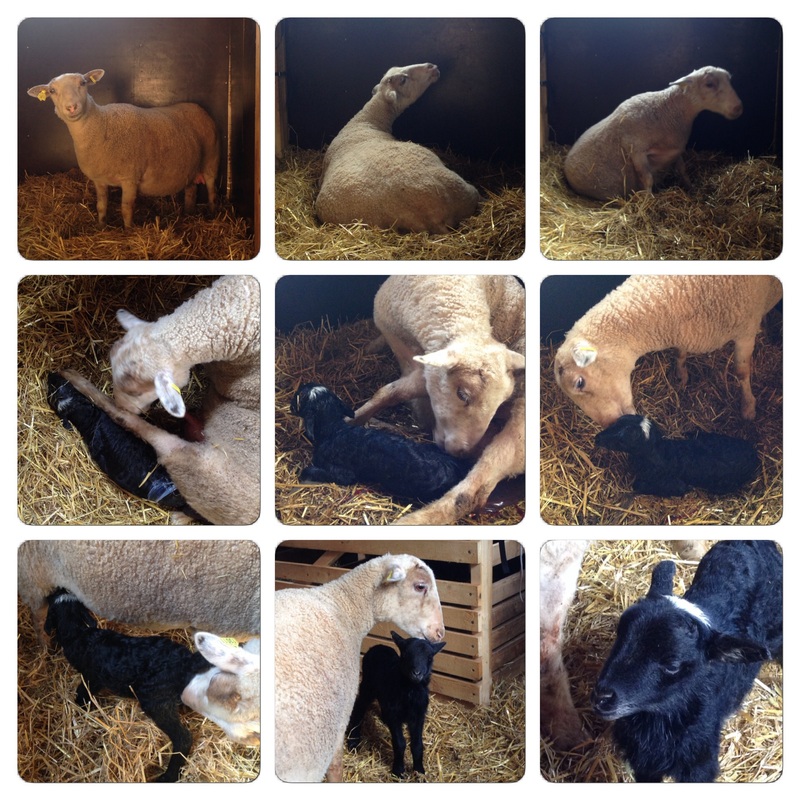 So, today we share her experience of the birth of new lambs. 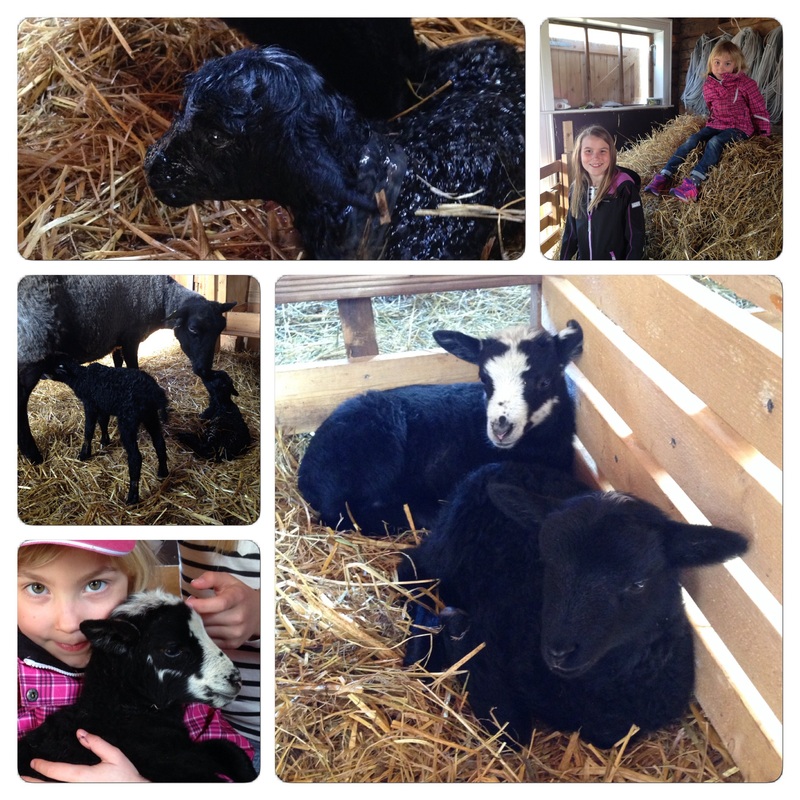 Spring has arrived (according to the calendar), which means the lambing season has started. Most sheep become receptive to mating in the autumn, when the length of daylight starts decreasing, and have their lambs in the spring, after almost 5 months of pregnancy (on average 145 days). However, some breeds are less seasonal, and can be manipulated with artificial light to mate at other times of the year. 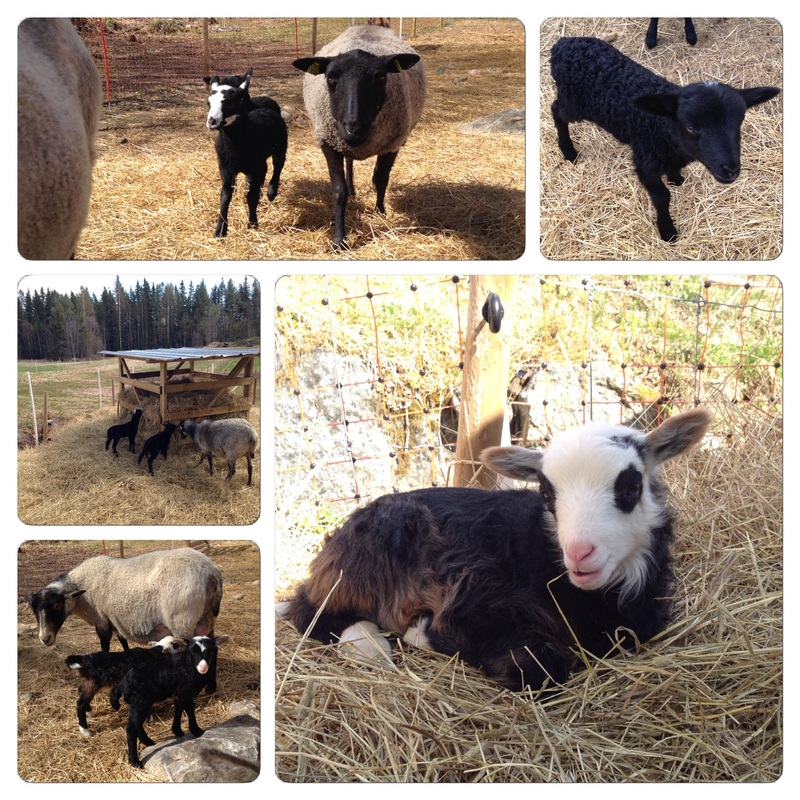 Spring is often late in the north of Sweden, so we waited until mid-December before we released our ram with our ewes. That postponed our lambing until May. Now, it would be nice if one could calculate the exact date for lambing, but nothing is ever that simple. The 145 days is an average plus/minus 3 days, and you never quite know when (or if) the ram actually mated with the ewes, as they are in estrus for 24 to 72 hours, every (again on average) 17 days. So when it is getting close, you need to look for tell-tale signs. Some are quite obvious, such as the swelling bellies (which look especially large when they are lying down). The base of the tail will also feel very loose (as if the tail had been dislocated), and when the belly drops, the area between the ewe´s hips and ribcage becomes concave. Suddenly the ewes look underfed, which mine are not. And the day before lambing, my ewes had conspicuously enlarged udders, showing that milk production had started. I thought that Citronella (on the photos above) would be the first to lamb. She was huge and we watched her closely (and frequently) for two weeks. But then suddenly, Lisen developed a huge udder overnight, and the next morning my eldest daughter found her with a lamb by her side. After watching and waiting about 30 min, the kids had to leave for school/preschool (they were a bit late that day, but we phoned ahead to explain why). I then decided to just quickly run back to the house to fetch a cup of coffee. And sure enough, when I got back less than 5 min later, Lisen had just had a second lamb. A few days later, we found Citronella in the barn with two new-born lambs. Luckily, the kids did not have to go to School/preschool that day, and could sit on a bale of straw (dressed in boots, nightclothes and a jacket) and watch the new-borns as long as they liked. It is such a relief when all goes well, and all the mothering instincts are in place. As a sheep-owner, you need to be prepared to intervene if there are any complications during lambing. We have opted for easy-lambing, traditional breeds, with smaller lambs (compared to meat breeds), and we do not give our ewes extra feed before mating (which can increase the number of lambs). Ewes only have two teats, and if a ewe has more than two lambs you usually end up having to bottle-feed the additional lambs. So far, all I have had to do after lambing is check for milk – and admire the lambs. I also weigh the lambs after birth and the next day, to ensure that they are gaining weight. Last to lamb was Brittis. She looked so much smaller than the others, so we thought we would have to wait at least another week. But, suddenly, she also developed pronounced udders, and the next morning she was not very interested in her portion of pellets. Hmm… a sure tell-tale sign! Now this lambing I was determined not to miss! So, I climbed up on a bale of straw and waited, as Brittis moved around and pawed the straw-bed. It is a sort of nesting-behaviour before lambing – although a bit annoying when I had just laid out a fresh layer of straw for her. Now she was digging up the older layers of dirtier straw. She laid down, stood up, moved around, laid down again, breathed heavily and stood up again. Over and over. And yes, I do remember how uncomfortable I was just before I had my kids… After an hour, I just had to run back to the house to get a cup of coffee. After another hour, I fetched another cup of coffee and an unfinished crochet project I had laying around. I ended up spending five hours on that bale of straw. But it is quite a pleasant way to spend time – as long as you have coffee and a piece of craft to work on. Finally, she went into labour, and I actually got to see the whole lambing. It really is amazing to see how quickly these newly born lambs scrabble to their feet and start suckling, during the constant licking and low, encouraging, grunting noises from the caring mother. Here is a short video of the first few minutes of the newborns life. A general rule is to keep the mother and her lamb/lambs in a small lambing pen for as many days as the number of lambs, plus one day extra. This gives them time to bond properly before they are released with the rest of the flock. Suddenly our little flock has more than doubled in number and there seems to be little black lambs running and jumping around everywhere. It will still be a while before we can let them out to graze (spring is very late this year), but they have access to an outdoor enclosure. And they sleep in the barn at night, which is much safer with a lot of foxes, and occasionally other larger predators around. 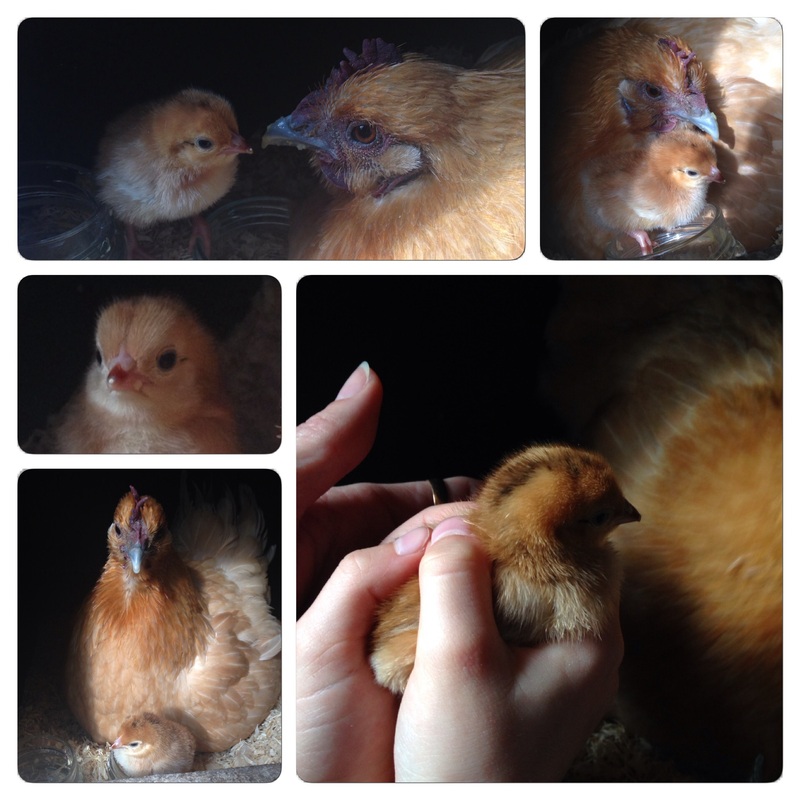 And I just cannot resist also showing you some photos of the first chicken that hatched here this spring. There is something very beautiful about a pair of small child’s hand carefully cradling a newly hatched chicken. The same goes for small arms hugging a lamb. Thanks Zara for sharing this wonderful experience with us. This entry was posted in Guest Artists, Guest Writer, Sheep Farming and tagged lambing. sheep farming. Bookmark the permalink. Wonderfully written, thanks Zara. & now you will have lots of lovely black locks next year? 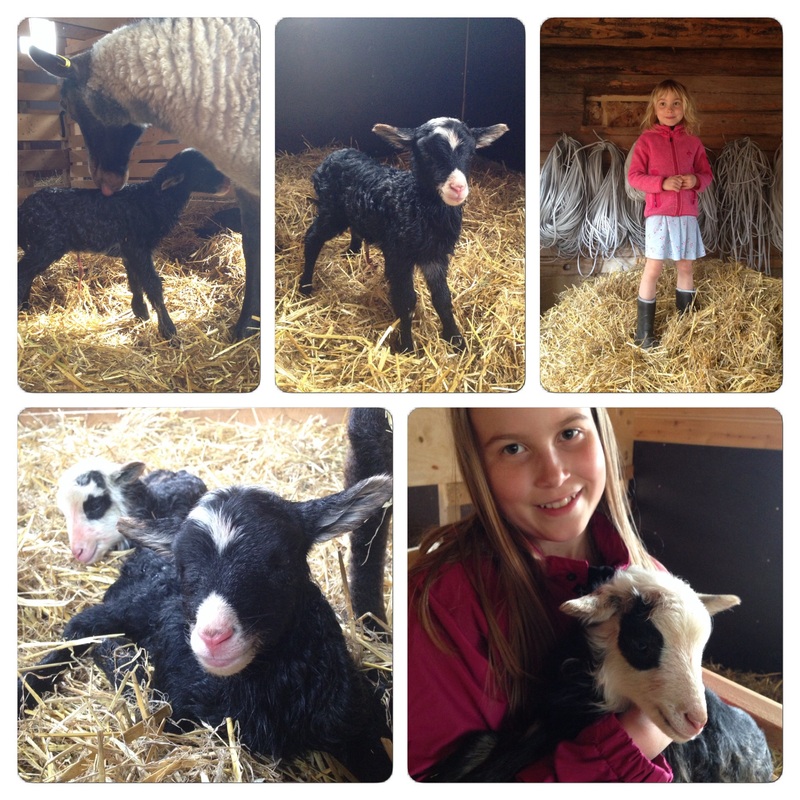 Zara, thanks so much for sharing the birthing of lambs (and chickens!). Your photos and text are so well done, that I almost feel like I was there on the farm. Great post Zara, it really is wonderful when everything goes just the way it should. we are about half way through here. Warm whether lambing is so much easier then midwinter lambing. Jag skrivit ett till gästinlägg på The Felting and Fiber Studio, denna gång handlar det om fem lamm och en liten kyckling. I have written another guest post on The Felting and Fiber Studio blog – this time about five lambs and a chicken. I’m so glad you were able to share this with us and took the time it capture it on video. Many of us are city raised or city dwellers and may never have the opportunity to witness a birth first hand. Yet, like Cathy, I felt like I was there. Thank you again! Thank you – it really was almost as good as being there! Beautiful post. Reblogged this on Lindy Hops!. Lovely Pics! Thanks! I run a flock of Stud Hampshire Downs in South Africa. One thing I’ve noted, a first timer often doesn’t have a developed udder to show lambing or nearness thereof. Saying that I had one last year who could’ve supported 3 more lambs she had so much milk but a small looking udder! Maybe it’s stretched for this year! I didn’t know about the loose tail! Thanks again!